If I had a FAQ page on my blog, “What brought you to Paris?” would surely be the first item. The problem is that I don’t yet have a clear answer. I came to visit a couple of times in my 20s, and as a pastry cook I was surely inspired by Paris. But I didn’t start studying French until 2006, and my motivations for doing so, and for embarking on a two-month stay not long after that, remain shrouded in some mystery to me. That trip was a bit of a disaster, yet I decided to come back the following year. And with subsequent visits things started to get easier. 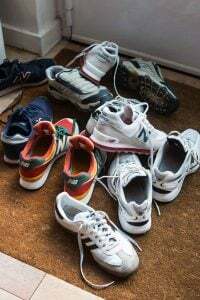 I used to think it was because I had become familiar with the culture and customs, and because I had made strides with the language and come to understand the rules of etiquette. Sure, there are people who move to Paris at the earliest opportunity because it is their own country that doesn’t fit them, who step off the plane with a perfect accent and well-tied foulard. But I am not one of them. The small-batch, full-fat yogurts that my local fromager carries are delicious, but I will never be able to pronounce “yaourt”. While I appreciate Parisian style as much as the next girl, I still ride the métro in my gym clothes. I have dated some French men but have had better luck, overall, with fellow Anglophones (keep it to yourselves, peanut gallery). I keep my windows open in the summer in spite of my neighbor’s grave and baffled disapproval. Though I have long been comfortable holding my fork in my left hand, I am still not entirely sure what to do with a fish knife. I love a good bistro meal, but I eat a burrito at El Nopal at least once a week. Because here’s the thing: No matter where you go, there you are. And so, when my birthday rolled around this year and I decided to have a party, it was not a moelleux or a biscuit or a dacquoise that sat in the center of the table, surrounded by a seriously good Ossau Iraty, delicate chèvre, crusty baguettes, saucisson, ham, figs, and no small amount of Champagne, but a carrot cake with cream cheese frosting. This recipe is an adaptation of one in Gourmet’s Best Desserts, tinkered with by my dear friend and pastry chef Heather Miller and me when we were working together at a now long-defunct NYC restaurant called Washington Park. We were on a brown butter kick, and decided to try using it to replace some of the oil in the recipe. It worked. 1. Preheat the oven to 350°F (180°C). Butter and flour two 8- or 9-inch (20-23cm) cake pans and line the bottoms with parchment paper. 2. To make the cake layers, sift together the flour, sugar, spices, baking soda, and salt. Set aside. With a handheld mixer or a stand mixer fitted with the paddle, beat the eggs until they are pale and frothy (they need not increase dramatically in volume). With the mixer running, drizzle in the oil and melted butter, then the vanilla. 3. Add the dry ingredients to the eggs and mix carefully until just combined. 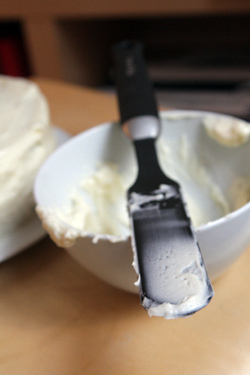 The paddle will accomplish this easily but if you only have a hand held mixer you may want to just do it by hand. 4. Fold in the carrots and raisins, then divide the batter between the two pans. Bake 30-35 minutes, until the surface springs back when gently touched. Cool the cakes completely before frosting. 5. 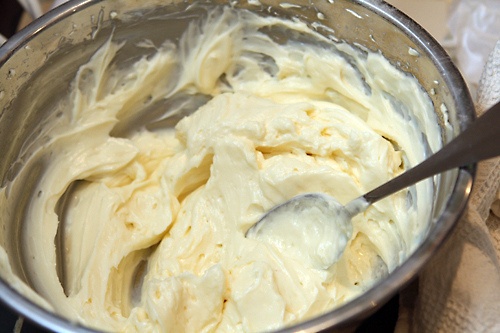 To make the frosting, beat the cream cheese and butter together until smooth. Slowly add the powdered sugar (do this on low speed to avoid a dust cloud) and mix until light and silky. Add the vanilla. Serving and Storage: This cake is best served at room temperature but will keep for a few days stored in the refrigerator. Visit Barbra at her blog, BarbraAustin.com and follow her on Twitter. Carrot cake is my favorite. I go for it for my birthdays and even had it for my wedding. Nice to read about your experiences in Paris. Thank you, thank you, thank you! 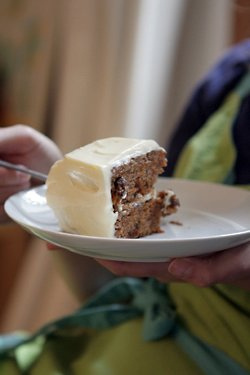 I was just looking another carrot cake recipe – I love the Frog Commissary one (so much that it was the cake at my wedding! ), but having another one up my sleeve also helps! Barbara, I love your post and can’t wait to check out your blog! Huge kudos to you for wearing your sweats on le metro… I lived in Belgium for many years, and found that not being able to run Saturday morning errands in my Penn State lounge gear was one of the hardest adjustments :) I, too, would choose carrot cake for any birthday party– it’s my favorite! 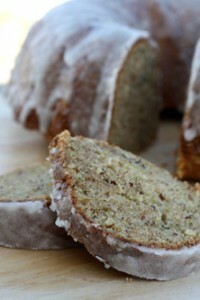 I just discovered the joy of baking with browned butter, too (http://food-hound.blogspot.com/2010/12/not-just-another-christmas-party.html). Merci!! 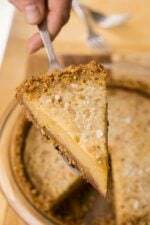 I love that the cake includes brown butter – this recipe looks amazing. Thank you! Yep, ‘you’re not French’ pretty much sums it up. Also ‘you’re not French and they’ll be able to tell the second you open your mouth, so why bother trying to look perfect?’ And ditto on the French men. David – you have probably noticed already, but Philly cream cheese is now findable at some Monoprix shops – 3.19 for 200 grams! 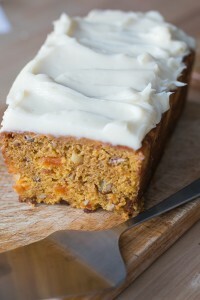 This is one carrot cake recipe I am dying to try. Brown butter? Funny, I had to ask Barbra for her recipe, too! 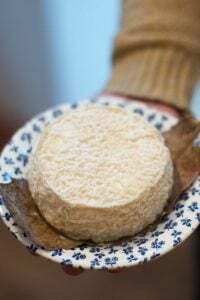 :) A French-American friend recently counseled me that Kiri worked pretty well as a cream cheese substitute, and I concur. Great photos, as always! Looks like the perfect birthday cake to me! Brown butter brings everything to a new level! Thank you David for introducing me to Barbra and her unique recipe for carrot cake using brown butter. I am curious how the brown butter tastes in the carrot cake so I will happily try the recipe to find out. guess i’m all-american too, used to ask for carrot cake on my birthday every year. love it ! 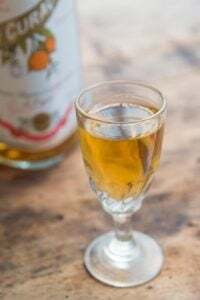 and if it weren’t for that pièce montée, i may have had one at our wedding too. ;) just happened to bake one a couple of days ago; only, instead of cream cheese frosting, i decorated with mini marzipan carrots. oh gosh, i’ve been in switzerland too long. I lived in Chile in the mid 90s. An Au Bon Pain opened in Santiago. I asked where their cream cheese was from, as the Chilean version of cream cheese was Not My Favorite, if you know what I mean. “Es de Philadelphia!” the clerk told me proudly. There really is nothing better than a well-baked carrot cake, and I know that without a doubt I would stand out in Paris more than the average American, but would still feel so blessed to be there! Actually, most parisians start out saying “what? cake with CARROTS? Ew” and then have some and rave about how good it is. My mother made carrot cake for a big family event and it was gone in minutes (this was after a long speech about how Americans cannot cook. But my mother somehow finds grace in their eyes because she has been in France for so long). 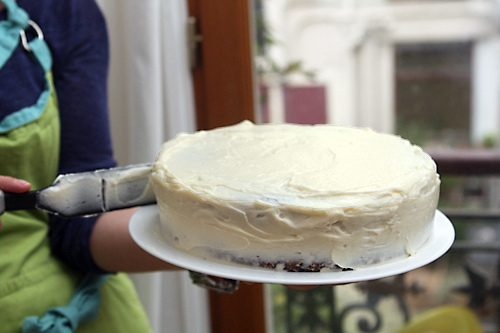 Admittedly, my mom makes the best carrot cake ever – it was always my favorite. But I might give this one a try too. And wonderful blog, by the way! I searched for a caterer who would let me have carrot cake for my wedding. I guess they were all concerned that you can’t tier cream cheese frosting. The one who made our cake put three layers on a tiered cake stand and it looked marvelous. Plus, twelve years later I still get comments about how good our wedding cake tasted! I’ve been looking for good ways to use some of the 7,000 carrots that are currently residing in my fridge (winter csa share=1/2 ton of carrots). This cake looks to be a perfect answer to the carrot quandry. Looking forward to checking out Barbra’s blog. Merci! Oh, this sounds wonderful. Strangely, for years a frozen commercial carrot cake from Oregon Farms was my favorite. In spite of being frozen/thawed, the walnuts, which I don’t see in this cake, were a big plus and stayed reasonably fresh tasting; and it had real cream cheese frosting. So, I’ll try again to get that dense, spice filled cake. I’ve tried some really bad carrot cake recipies and Oregon Farms seems to have disappeared, so I can’t cop out any longer. Thanks for the recipie David and Barbra. I’ll consider it a fine Christmas gift. So if I ever get to visit Paris, do you suggest I bring Philadelphia Cream Cheese for bribes :-). Ah, brown butter! If you can’t have the cream cheese frosting, try brown butter and icing sugar, it goes well that kind of cake. Thanks, this is my absolute favorite ! Oh my, browned butter in carrot cake? That is stupendous! Who thought carrot cake with mounds of cream cheese could taste any better? This is very similar to a carrot cake in an old recipe book called “Freezing & Canning Cookbook” edited by Nell B. Nichols Field Food Editor for Farm Journal. It was published in 1963. The only real difference is it has pecans instead of raisins. Wonderful carrot cake. what made me leave my own country – that incomparable bliss of having Chrístmas every day. Rather what waking up in Paris is all about n´est-ce pas? The carrot cake seems heavenly but do admit the millefeuille from La patisserie des rêves on 92 rue du Bac in the 7th arrondissement is a piece of art and a joy forever. 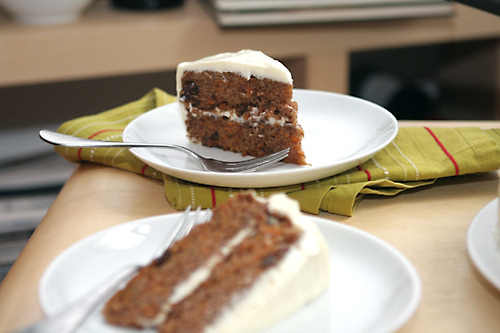 Growing up in the Bay Area in the ’60’s, I was never a fan of carrot cake–too ubiquitously everywhere. Too cliché. But this recipe and post had me almost salivating. I wonder if my 13-year-old son would accept this instead of his normal birthday cake next week. Our carrots are still too small, but as luck would have it our friend grows them organically as well, and another friend brought a couple cases of organic cream cheese when he came for Thanksgiving. Thanks again for this timely and “delicious” post. I do like good carrot cake! My recipe includes two cups of carrots and also one and a half cups of crushed pineapple. Frosting is made by heating in a sauce pan margarine and cream cheese, allowing to cool then the vanilla and confectioners sugar stirred in. Thanks for great posts. Oh, David. This is such a wonderful, beautifully written post! I absolutely love your succinct, obvious-yet-when-reading-it-one-thinks-oh-wait-yes-that’s-true “No matter where you go, there you are” phrase. I think that’s why I love travelling so much – because I just want to “be” in different places. And, of course, another stellar dessert. I think I’ve only had tastes of other people’s slices of carrot cakes in my life. Perhaps I should bite the bullet and make one myself, finally! Your blog is as delicious as the cake promises to be. I was hoping tonight to find a blog up date from david Lebovitz . Imagine he was so kind to send you my way. Truly Carrot cake with Ice cream!!!!!!!!!!! Thanks, everyone, for your comments. 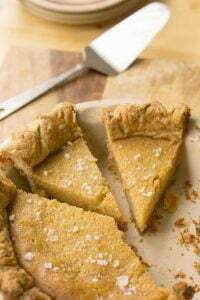 The brown butter – which, again was my friend Heather’s strike of genius – really does add a little something, and I’ve had fun experimenting with it in other recipes. It doesn’t behave exactly like fresh butter but the flavor is so, so good. Norine – If you’d like to bribe me (to what end I’m not sure), I suggest maple syrup or cold hard cash. 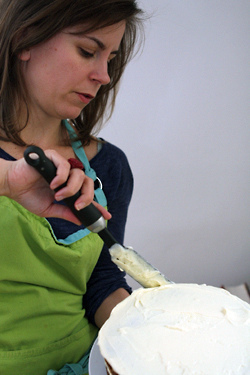 Jill – Kudos for insisting on a wedding cake that actually tastes good. Most of them don’t, so I’m not surprised people remember yours. Kerrin – You can try to make me say “yaourt”, but I’m telling you right now that what comes out of my mouth will be unrecognizable in any language. David – Thanks again for inviting me to do this post. You absolutely “nudged” me towards Paris, to put it mildly! Barbra, Carrot Cake and Confucius! Clever! I just looked at your site and was delighted to learn about Creme de Marrons… sounds fabulous! 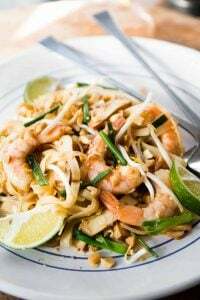 Love your site, love this recipe! I adore carrot cake, and I too made it for my first wedding. The marriage didn’t last, but the memories of the cake did! I’m glad to see that Barbra’s recipe does NOT include the hated ingredient, coconut, which is an abomination in carrot cake. 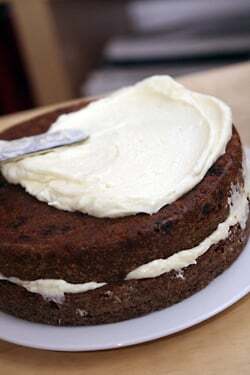 And any excuse to eat cream cheese frosting is good, but the way it complements carrot cake is unparalleled. Thank you so much for posting this. If I have ever made carrot cake before it is a dim memory and can’t have been a good one or I would have carried on making them. My sons had been hankering for carrot cake (here in Paris! dream on) and when I saw this, I thought, why not. I am a bit ashamed in that I could have gone to the effort of making the brown butter, but thought oh, it might not work and oh, the butter is more work and well, I am lazy and not overconfident in my baking abilities. Not a good combination. To get to the point, the cake I just made is fantastic, truly better than any other cake I have ever baked, no exaggeration. I am just sad that I didn’t go the extra mile with the butter. So anyone reading this (even rank amateur) go for it with the butter, the recipe is worth the effort. Mille mercis! I’ve had the good fortune to show up at this chef’s apartment for the birthday fete and got to taste this AMAZING cake. Now the recipe is public! Yay! It’ll make the Paris to NYC move taste better:) Merci buckets…..
My french husband made this recipe tonight for dessert. Success! It was wonderful. We were able to find Philadelphia cream cheese at Monoprix. The icing was delicious but it was quite runny. We put it in the refrigerator to set but after 10 minutes we could wait no longer. Yum. I love carrot cake. It has been so long since I had it. I’ve got a question for Barbra … did you use genuine Philly for the frosting, or St-Moret? I love me a good US-style carrot cake, but whenever I’ve used St-Moret for the frosting (difficult to find Philly here), it’s been a complete disaster. As soon as you beat it with the butter and sugar, it goes completely liquid and even an hour in the fridge doesn’t cure it. Love the idea of browned butter — inspired! Hi Christina: One of the best books I know about the science of baking, explained in easy-to-understand terms, is Cookwise by Shirley Corriher. It’s a great reference. Her more recent book, Bakewise, concentrates on baking and is likely more available at your local bookseller for last-minute gift giving! Veronica, I use good ol’ Philadelphia, which is getting easier to find in Paris. I’ve seen at at La Grande Epicerie, at some Italian traiteurs (not sure why) and someone said in the comments that Monoprix is starting to carry it. Christina, I second David’s rec., and had a pang of envy/nostalgia when you mentioned Bonnie Slotnik, which is in my old neighborhood. Thanks for sharing this cake recipe. Just right for the season. I found your article in google and I felt like commenting because I was benefited. I have always loved carrot cake, kinda afraid to be left alone in a house with it, LOL.This looks like a recipe I would try that. Thanx for sharing. Happy belated B’day! that is so funny because I had a carrot cake bakeoff for my B’day last jan. 3 of my friends & I each made a carrot cake. mine of course won even with the blind taste test. It’s around this time of year that you signed Room for Dessert for me in Paris in about 2002 so I’m loving The Sweet Life in Paris – imagining I’m there again having lots of delicious adventures! Hi, I’m trying this to night. Hope it’s delicious. Thank you David and Barbra for your recommendations. I will contact Bonnie and see what she can do. I would rather give her the business that the large chains. She is the greatest resource and has been finding off the wall and old cookbooks for me for years.. I made this tonight and it is wonderful. I live in Mérida México where you will rarely see an American style carrot cake. I read this recipe and knew I had to make it. 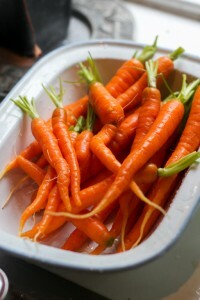 The carrots here are fabulous, with lots of flavor, and I think that made it even better. I did use brown sugar instead of white, I like a dense, dark carrot cake. I can’t tell you how fantastic it is!! I have to admit that I only have one round cake pan so half of the recipe went into cupcakes. That turned out well since we HAD to try it as soon as it cooled and now I still have a complete cake for guests. Philly cream cheese is no problem here, Mexicans are enamored of it. Too much really, they put it in sushi! I’m a big fan of your blog David, a little of Paris in Mexico is a fine thing. Thank you for the link to Barbra’s blog as well, fantastic! Thank you so much for this recipe. I was just out at Fanelli’s in Soho (NYC) with my son and he declared that he loved everything about that day but if only he could have some cheese cake. We found a piece at a nearby bakery but it wasn’t that great. Now I am going to make him some with this recipe…yay! as the 13 year olds say. This is my husband’s favorite cake. Thanks for the recipe, I will have to try this. It looks delicious. Thanks for the recipe!!! the brown butter makes this recipe !! It’s the best carrot cake I’ve had. I made it for Christmas dessert…and I’m making it again to treat my coworkers for the holidays…. could I make this recipe in a large rectangle pan…just easier to share at work. maybe 40-45 mins? So true! 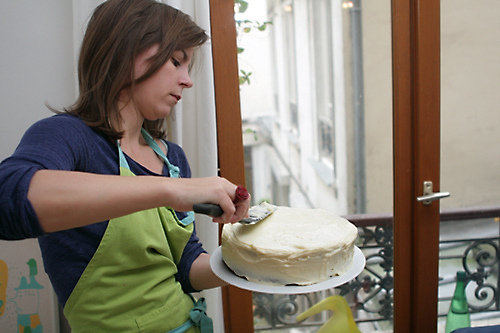 I was just in Paris for a while at cooking school and one of my Parisian friends became ecstatic when she found out I could tell her how to make American carrot cake. I had no idea. 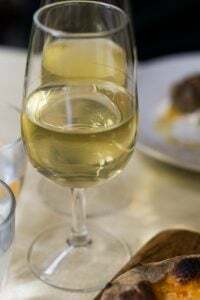 Since France so clearly has the edge on the market with cuisine and patisserie, it makes me feel kindof nice that we at least have a little something to offer this side of the Atlantic. This looks like a great recipe–thanks! I gave this recipe to my partner and told him it was the birthday cake I wanted him to make for me. Yesterday was the big day, and the cake was a GIANT hit. OMG it’s amazing. He said the batter was pretty stiff until the sugar and other ingredients got the carrots to give up some additional moisture. And he had the same problem some others have had with the icing not getting hard. (He stuck it in the freezer to harden the crumb coat before adding the rest of the frosting. But it was a wonderful masterpiece. Sadly, there were no leftovers! I’d like you to know that I baked this cake as my last 2010 dessert for my family. I followed your recipe to the T and cannot tell you how happy I was with the outcome! My family loved it so, so much, that they have requested I bake it again this weekend!!! They were never (ever!) carrot cake fans and they simply were taken away with this recipe. THANK YOU Barbra for sharing this one. THANK YOU for being so clear with your recipe… It was a fun and truly one of the best recipes yet. I look so forward to following your blog now that I have met you through Lebovitz’s blog!! Happy New Year to you all !! This looks so yummy with a frosting on it. My mother used to bake carrot cake but this recipe looks way too yummy than what I used to eat. Thanks for posting this! Will let my mother know about your recipe. One of my favorite things to eat in the world as far as dessert goes. So I will certainly print this recipe out and make very soon. Although I would have made it today if I hadn’t just baked a Dulce De Leche cheesecake. Ok time to finish off the cheesecake and make this next. I have tried baking carrot cake last week and it was a disaster. I was my first time to bake a real cake and too bad it was a disaster. Well seeing you recipe makes me want to try again. Ha! Ha! Ha! I hope this time I make it right. 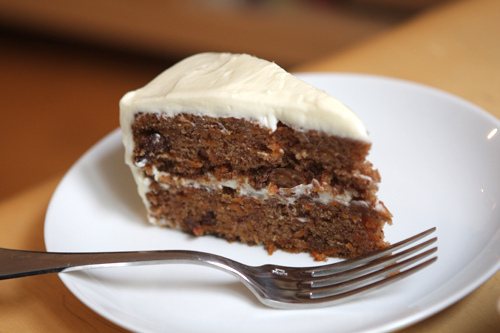 I adore carrot cake. I made it for my first wedding, and I would eat it for every meal if I could, but only if it didn’t have coconut. I’m thrilled to see that this recipe is unadulterated by coconut. My mom loves carrot cake. She also loves cream cheese. This looks like the perfect combination for her to try out! Thanks for posting the recipe and the pictures!